Excelify app works with Excel file template that is organized with Sheets (tabs). The same data that is exported, can be imported. Mark with checkboxes, what data to export. In the “Include data” you can include additional data of each kind of items. Export only the data you need, because that impacts the duration how long the export will take. Export becomes significantly longer if you include Metafields. Choose the format in which to export. If your store is very large, choose the “Excelify: CSV” format. Read more about the formats. To start the export, press the “Export” button. To focus on a specific list of items, use the Filters. You can filter different items by different criteria. When you apply the filter, the item count and estimates will not change at that point – the estimate will adjust when you actually start the export. For some filters it still has to run through all your store though, to find those items. 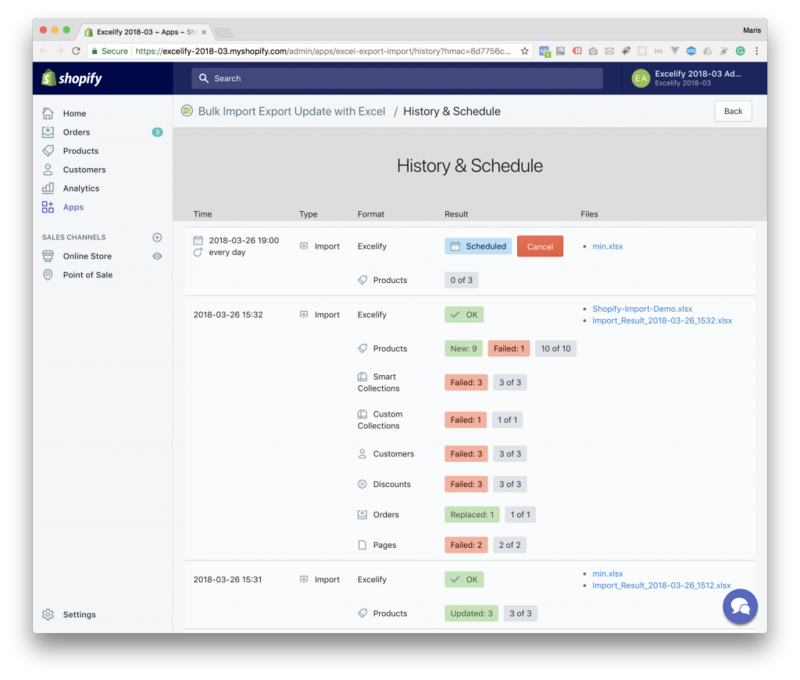 You can specify additional Options for the export, like schedule and/or repeat the export. You can specify a custom file name for the export so that the exported file URL is always the same. Ideal to use for regular backups or outgoing data feeds. Read more about supported import formats. When you upload the file, at first the app is analyzing the file. After that, you can choose the options and press “Import” button if everything is showing ok. When you import, you don’t have to import all columns. You can import only the columns you need to update. The app will identify the product by “ID”, “Handle” or by “Variant SKU”. It can update or create new Collections, Customers, Orders, Pages, etc. with just a few columns, or all of them. In each sheet, you can use the “Command” column, by which you can tell, what to do with the row that is being imported. NEW: will try to create a new item with the provided details. If such item will already exist (with the same ID or same Handle), then the result will be Failed. UPDATE: will try to find existing item by ID or by Handle, and update it with data from the row. If such item will not be found, then it will create new. REPLACE: at first, if such item with provided ID or Handle exists, then the app will delete it. After that, it will create a new one. If an existing item will not be found, then still the app will create a new one. The difference from UPDATE is that it will not keep any of columns, which were not included in the import file since the item will be deleted and re-created. DELETE: the app will delete the existing item, which is found by ID or Handle. If such item will not be found, then the result will be Failed. This DELETE command is very handy for deleting items in bulk. If no Command is specified, then the app will assume the UPDATE command. When updating items with related items – like Product Variants, then it merges your variant rows with existing variants, by find existing variant of the Product by its Variant ID, then by SKU, then by Barcode, then by Option values. To delete Variants, use “Variant Command” column with value “DELETE”. Or put “REPLACE” if you want to replace all variants of that product to your new variant rows. The same principle works with Product images. By default, it merges existing images with your image links, but you can DELETE or REPLACE images too. You can update all images of all Products at once. You can link images to Product variants all at once. You can add new variants without having to list the existing variants – just import the additional variant rows, and the app will merge them automatically. Much more. See Tutorials for more inspiring ideas. Since Metafields are just additional rows in the same import file, all you need to do is – put the Metafield columns and set their values as you need. Ignore ID – will ignore the ID values of the imported file items. This makes import run faster if importing an export file from another store. Don’t ignore ID if you import data from the same store – then app will use ID values to identify items very fast. Check if items already exist – will make sure that if an item with the Handle you are importing, exists, then the app will update it. Remove this checkbox if you are 100% sure that the data you are importing, is new to the store and you need to maximize the import speed. If you remove this checkbox then you may result in duplicates if imported items will already exist in your store. Remove images from Body HTML – read more about removing images from Body HTML. Schedule import at – choose date and time when to actually do this import. Repeat every – choose the time interval, when to repeat this same import. As it imports, it will show how many items are New, Updated, Replaced, Deleted or Failed. It will also calculate more precise time estimate as it moves on – from the real speed of your items. If you notice that you get too many Failed, or just that you forgot to add something, you can cancel the import any time. When you cancel the import, you will have a chance to download the Results file. After you import the file, the app generates Import Results file with additional two columns that show status for each imported item, and detailed error message, if the import has Failed. It will contain only those rows, which were imported. That way you can review, what was imported, what were the errors. And that way you know, which items it actually imported, so that if you need to continue, you can exclude those already imported items from the next import. 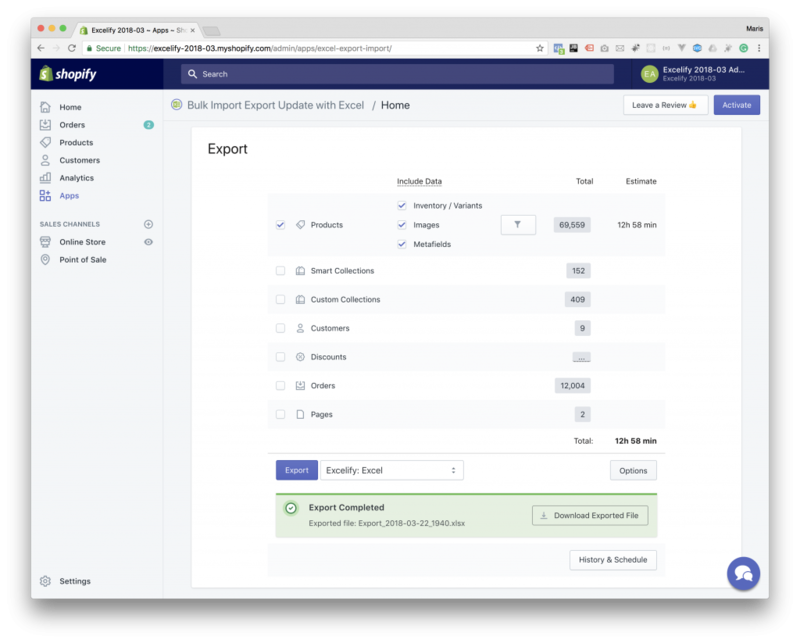 If your import speed is a concern, read more about improving import speed in the tutorial: How to maximize Shopify bulk import speed? Maybe strange, but really useful is that each Product (or any other item) will have the same “Import Comment” value for all its rows, so when you read them, consider them about the product as a whole, not about each line. The convenience here is that in case you need to filter rows by the import comment, you can easily filter them in Excel, and know that your filtered results will contain all the rows of that product, because “Import Comment” column value is the same. Before importing the whole file, import one item to make sure you have set everything as you need. Once you made your test import, and results are as you need, only then import the whole file. If you cannot do tests in your live store (and, in fact, you shouldn’t), you can always create the free Shopify store for tests and activate Excelify for free from your paid Excelify app Settings – for free. Meaning, that you don’t need to pay for your second store. That way – you can do safe tests in your test store, and be confident what will happen in your live store. 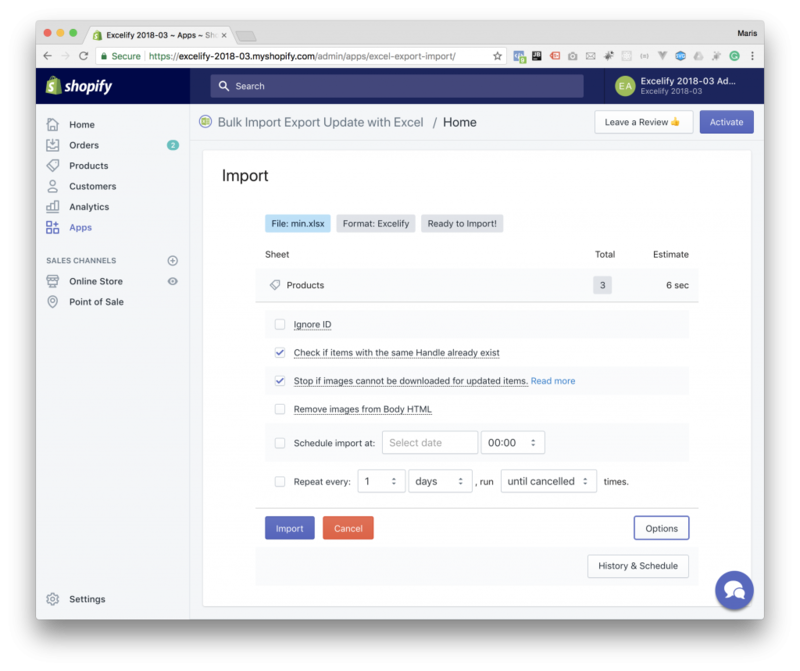 You can even export everything from your live store to your test store, and then apply the new imports in your test store, to see what will happen to your live data. Once you gain that confidence, you will be ready to do the same import in your live store and know exactly what will happen with your import there – without guessing, because you already tested in your test shop. Important: before importing, keep your exported file as a backup. Just in case you mess up the data, you can import the exported file to restore it back. When pressing the “History & Schedule” button, you can see all the past import and export jobs. You can download all the files for each job. And you can see what happened to each of the past jobs. More than that, you can see the future scheduled jobs as well. And you can cancel any scheduled or running jobs from here, too. When you run the export or import, you don’t need to keep the browser open – you can close it and come back later to check the progress. Initial import and export estimates are very approximate average because it really depends on your real data. Once the export or import actually starts, the estimates become very precise, because then those are showing about your current export or import, with your real data. See the details of each template sheet.